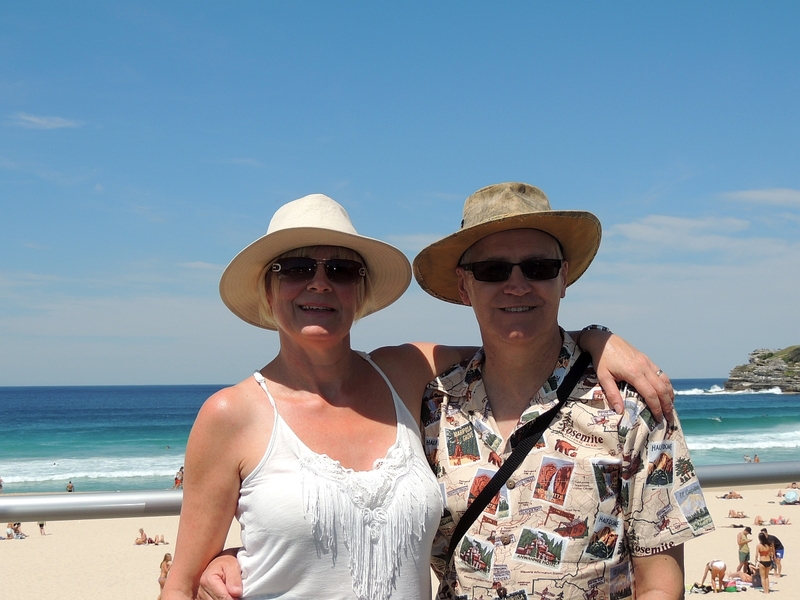 Wake early again so we have a lovely stroll along the beach to The Pantry - a beachside cafe. 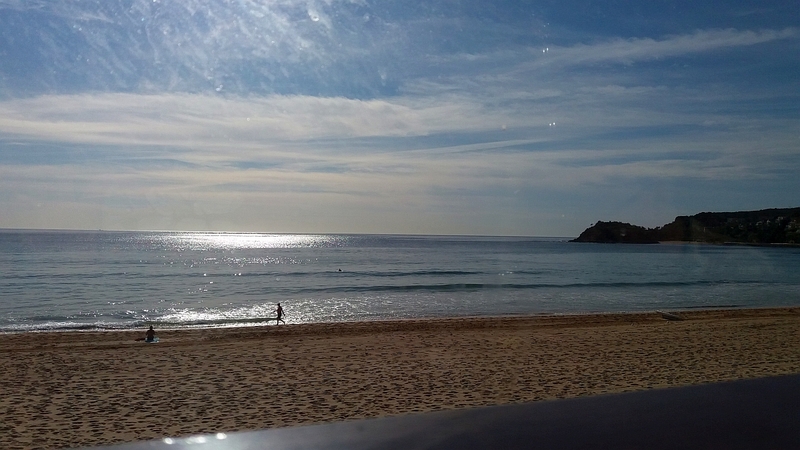 We take a seat at a window table overlooking Manly beach and watch the joggers, surfers, pram pushers, swimmers and dog walkers enjoying the morning sunshine. 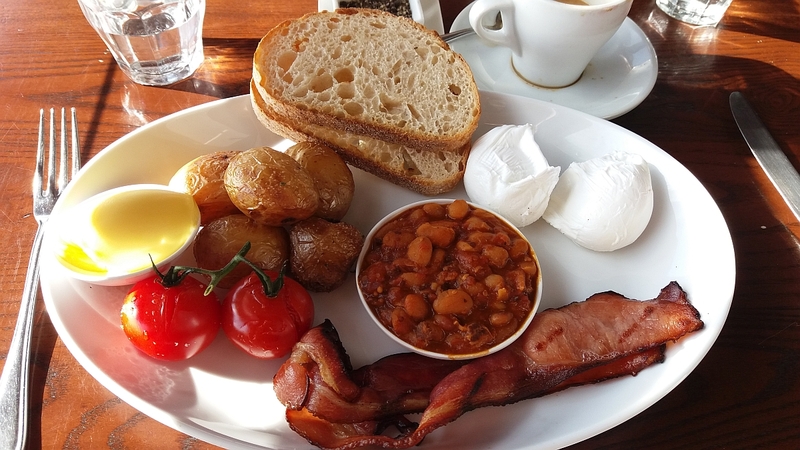 We have sour dough toast, grilled baby tomatoes, bacon, poached eggs, baby roast potatoes and homemade baked beans which are very tasty and a great start to the day. Today the plan is to leave early and drive out to some of the southern beaches and through the Royal National Park, but we get a text from Serena to say they are running late. So we take a slow walk back up the beach and sit out side the hotel to wait for their arrival. 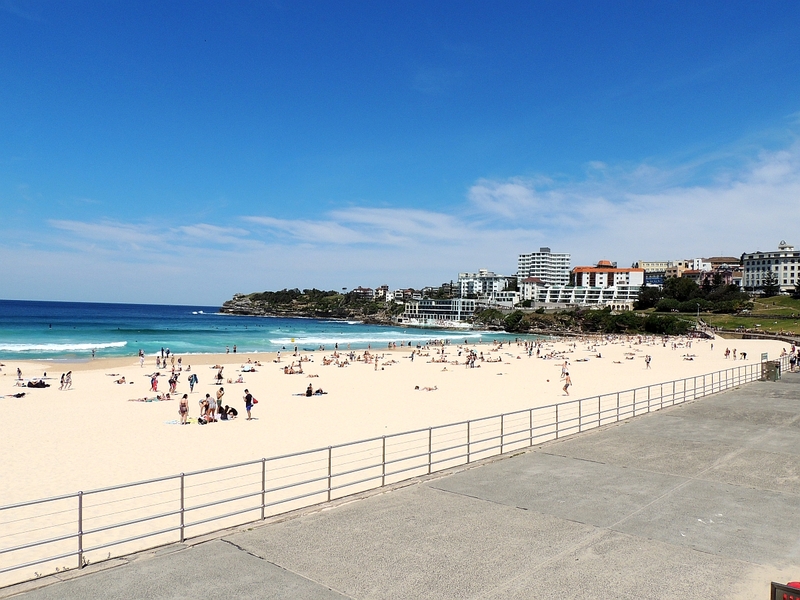 Once they arrive we hop in the air conditioned car which is very welcoming as by now the temperature has begun to climb, Our first stop is Bondi Beach - seeing as we're passing this way we decided we'd like to see it as after all it is iconic. Fiona parks in the car park above it and we get out and take some photos and video. What a huge expanse of beach this is and it's great to see the surfers out in force enjoying the waves. Back on the road and before too long we are in Brighton Beach which is situated on Botany Bay. Serena, Fiona and Perry want some lunch so they go to a Japanese restaurant while we take a walk to the beach and get a cold drink. From here the view is somewhat spoiled by the oil refineries but you can also get a good view of the planes coming into Sydney airport. 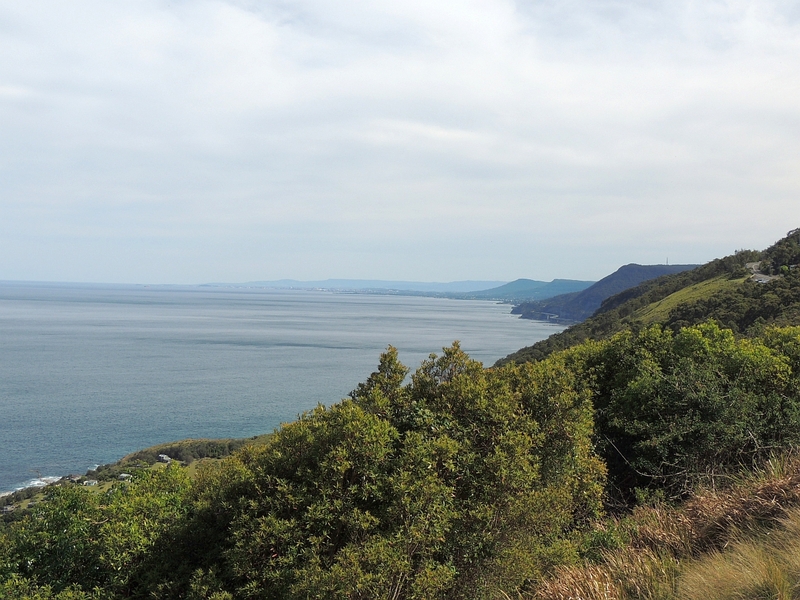 After they've finished lunch we head off through the Royal National Park, down and round countless tree lined bends through the forest we drive past a river and then up the other side towards the coast. 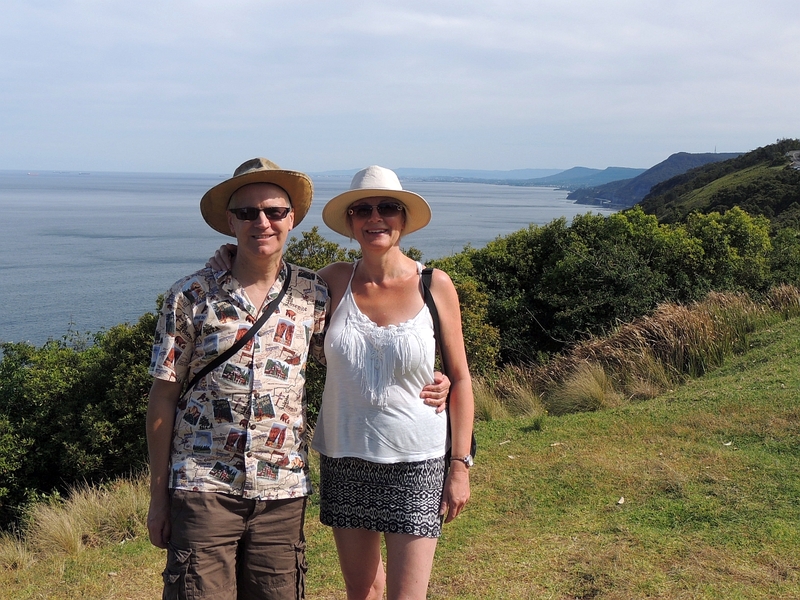 We stop at a couple of places to take in the views of the beaches, including Garie Beach outlook  a stunning expanse of golden sand surrounded by lush vegetation and then on we drive up the Grand Pacific Drive. This takes us over the Sea Cliff Bridge and this whole drive reminds us very much of Californias Pacific Coast Highway and the Bixby Bridge. Unfortunately there are warnings of brush fires, and some of the roads are closed due to this, which means that we cant get home by the easiest route. 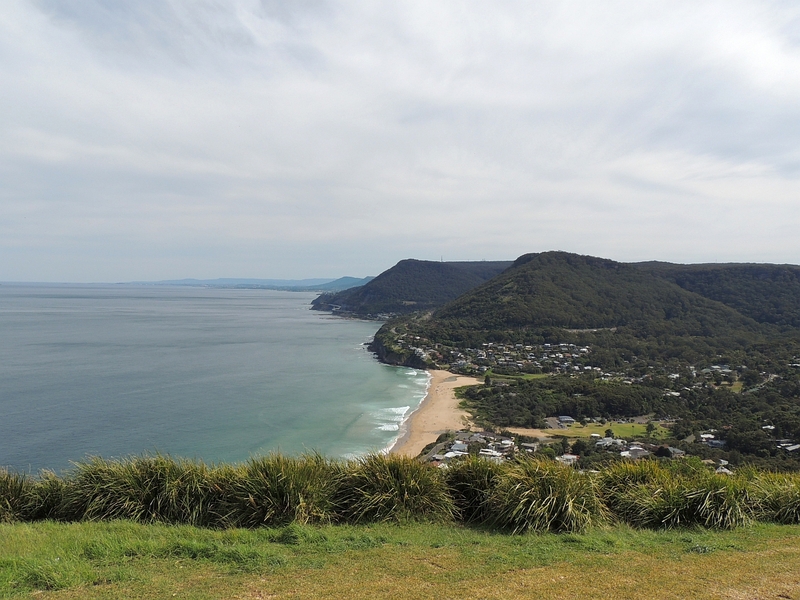 We end up hitting Thirroul and really bad traffic jams  no matter which way we go we end up in a queue. Eventually though we find a way to escape the madness and drive through pretty countryside which is predominantly used for dairy farming. The journey home seems never ending and we eventually have to stop for a bathroom break  thankfully we find a nice little club where the receptionist takes one look at our sad faces and allows us to use their restrooms. Eventually we get back to Manly at 7.15pm. We say our fond farewells to Serena, Fiona and Perry and thank them for showing us the delights of Sydney and the surrounding area during the past 6 days. We had a fantastic time and will be back some day to explore more of this glorious city and the wonders it has to offer. Hopefully we will meet again in 2018 in jolly old England as there are two family weddings planned for that year. Our plans for packing and a civilised dinner and cocktails are thrown into disarray as it is so late, so we head straight to Hugos. This is a lovely waterside restaurant that we have had our eye on  however because of the time they are extremely busy and tell us it will be about a 1 hour wait. We are so hungry we decide to pass on this and wander up the road until we find Whitewater restaurant. 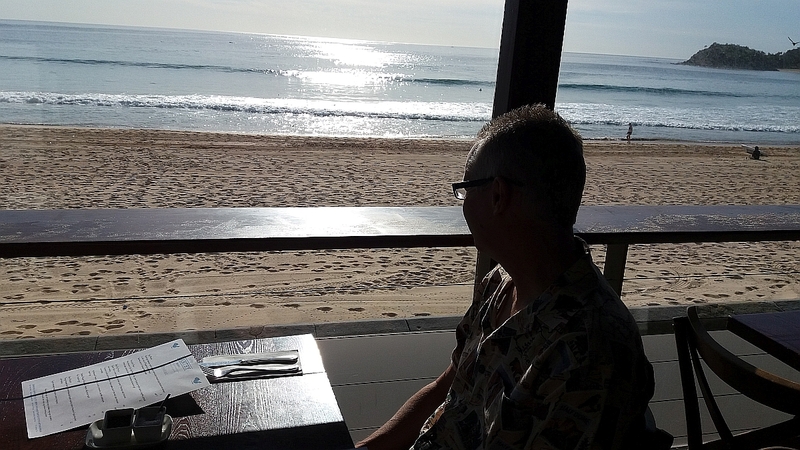 We decide to sit inside rather than on the outside terrace and Kev chooses surf and turf whilst I go for seafood gnocchi - which is very good. Have a couple of beers each to quench our thirst and pay the bill of AUS $115 including tip. Back to the hotel we go, have a shower and then sit on the balcony listening to music, drinking cold beer and looking over the lights of Manly beach, for the last time, before bed.